For the surrounding metropolitan area (Northwest Arkansas), see Fayetteville-Springdale-Rogers metropolitan area. Nickname(s): "Track Capital of the World", "The Hill"
Fayetteville is the third-largest city in Arkansas and county seat of Washington County. The city is centrally located within the county and has been home of the University of Arkansas since the institution's founding in 1871. Fayetteville is on the outskirts of the Boston Mountains, deep within the Ozarks. Known as Washington until 1829, the city was named after Fayetteville, Tennessee, where many of the settlers were from. It was incorporated on November 3, 1836 and was rechartered in 1867. The four-county Northwest Arkansas Metropolitan Statistical Area is ranked 105th in terms of population in the United States with 463,204 in 2010 according to the United States Census Bureau. The city had a population of 73,580 at the 2010 Census. Fayetteville is home to the University of Arkansas, the state's largest university. When classes are in session, thousands of students on campus dramatically change the city's demographics. As a Southeastern Conference institution, thousands of Arkansas Razorbacks alumni and fans travel to Fayetteville to attend home football, basketball, and baseball games. The University's men's track and field program has won 41 national championships to date. Forbes ranked Fayetteville as the 8th-best city for Business and Careers in 2010. U.S. News ranked the city as one of the best places to retire. Based in nearby Bentonville, the Walmart corporation has contributed to Fayetteville's economy. The city hosts the Wal-Mart Shareholders Meetings each year at the Bud Walton Arena. Forbes magazine ranked the Fayetteville–Springdale–Rogers area as the 2nd-best area in the United States for recovery from the current United States recession. Reasons cited were the presence of Walmart (one of the top Fortune 500 corporations in the area) as well as low unemployment (5.0%) compared to national averages. In 1859 a city charter was obtained from the Legislature. During the Civil War the municipal government was suspended and was not reinstated until 1867. P.V. Rhea was the president of the town trustees in 1836; J.W. Walker was the first mayor under the charter of 1859, and M.L. Harrison was the first mayor when the government was reorganized in 1867. The telegraph came to Fayetteville in 1860, strung along the Military Road from Jefferson City, Missouri to Little Rock. Newspapers were established early; in 1859 Elias Cornelius Boudinot, a young European-Cherokee attorney, and James Pettigrew founded The Arkansan. The Fayetteville Weekly Democrat began publishing in 1868. It later developed as the Northwest Arkansas Times, and is still in print today. The Fayetteville Schools District was founded on March 20, 1871 as the first independent school district in Arkansas. The public school system was established by the Reconstruction era legislature; before the war, all education was private. Arkansas had struggled with a state banking crisis, resulting in the illegality of banking until 1868. Following the reinstatement, the Stark Bank became the first bank in the state in 1872, becoming the William McIlroy Bank four years later. This institution remains today as Arvest Bank. Fayetteville is located in the Boston Mountains, a subset of The Ozarks which run through northwest Arkansas, southern Missouri, and Eastern Oklahoma. The rocks of the Boston Mountains were formed when sandstones and shales were deposited on top of the Springfield Plateau during the Pennsylvanian Period. 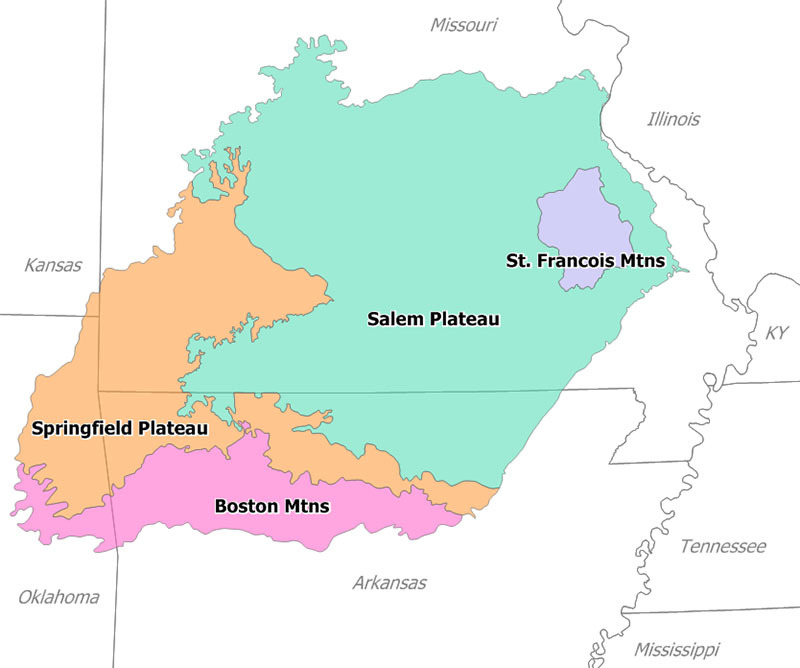 In the Fayetteville area, following uplift during the Ouachita orogeny the sediments were eroded to expose the Mississippian limestone formations of the Springfield Plateau, while south of Fayetteville the remaining deeply eroded Pennsylvanian sediments form the steep Boston Mountains. According to the United States Census Bureau, the city has a total area of 55.2 square miles (143 km2), of which, 53.8 square miles (139 km2) of it is land and 1.4 square miles (3.6 km2) of it (2.59%) is water. The city is centrally located in Washington County, Arkansas along Interstate 49/US Route 71. This is the only fully controlled access route through the area, which replaced the winding US 71 (now US 71B) in the 1990s. An interstate connection with Fort Smith to the south and Kansas City, Missouri to the north has greatly helped to grow Fayetteville. Within Washington County, Fayetteville is bordered along the north by Springdale and Johnson. At times, this transition is seamlessly urban. Fayetteville is not bordered to its south, instead opening up to scenic country along the Boston Mountains Scenic Loop. Past the communities of Greenland and West Fork is Devil's Den State Park. To the west is Farmington along US Route 62 and to the east is undeveloped land in rural Washington County. Generally the parts of Fayetteville west of I-49/US 71 is called west Fayetteville. Another prominent district is Uptown Fayetteville, which encompasses the scores of business and new homes near the Northwest Arkansas Mall in north Fayetteville. The University of Arkansas defines its own part of Fayetteville, with dozens of student apartments and restaurants located near campus. The University's impact is also apparent along College Avenue, which contains hundreds of shops and restaurants. Northeast of campus are the Wilson Park Historic District and the Mount Nord Historic District. The Fayetteville Historic Square is the original city center of Fayetteville, and Dickson Street is the best-known entertainment district in Arkansas. Homes atop Mount Sequoyah in the eastern part of the city encircle Mount Sequoyah Retreat and Conference Center. Old structures are also located along the former Butterfield Overland Mail route, a stagecoach route to San Francisco, California now known as Old Wire Road. Fifteenth Street forms the southernmost residential district of Fayetteville, with the Fayetteville Industrial Park to its east. July is the hottest month of the year, with an average high of 89.1 °F (31.7 °C) and an average low of 68.6 °F (20.3 °C). Temperatures above 100 °F (38 °C) are rare but not uncommon, occurring on average twice a year. January is the coldest month with an average high of 44.3 °F (6.8 °C) and an average low of 24.2 °F (−4.3 °C). Highs below 32 °F (0 °C) occur on average thirteen times a year, with 2.2 nights per year dropping below 0 °F (−18 °C). The city's highest temperature was 111 °F (43.9 °C), recorded on July 14, 1954. The lowest temperature recorded was −24 °F (−31.1 °C), on February 12, 1899. In the 2010 census, Fayetteville had a population of 73,580 and grew by 26.8 percent from the year 2000. As of the census of 2010, there were 73,580 people, 33,661 households, and 14,574 families residing in the city. The population density was 1,333.0 people per square mile (514.0/km²). There were 38,281 housing units at an average density of 693.5 per square mile (267.4/km²). The racial makeup of the city was 83.8% White, 6.0% Black or African American, 1.1% Native American, 3.1% Asian, 0.2% Pacific Islander, 2.8% from other races, and 3.1% from two or more races. 6.4% of the population were Hispanic or Latino of any race. Fayetteville was the second best educated city in Arkansas (after Maumelle) in the 2010 Census, proportionately, with 50.5% of adults age 25 or older holding an associate degree or higher, and 42.6% of adults possessing a bachelor's degree or higher. In the city the population was spread out with 16.9% under the age of 18, 23.6% from 18 to 24, 31.5% from 25 to 44, 19.3% from 45 to 64, and 8.4% who were 65 years of age or older. The median age was 27.8 years. For every 100 females there were 100.9 males. The median income for a household in the city was $34,393, and the median income for a family was $72,258. Males had a median income of $48,004 versus $36,373 for females. The per capita income for the city was $26,267. 23.7% of the population and 11.9% of families were below the poverty line. Out of the total population, 16.0% of those under the age of 18 and 5.3% of those 65 and older were living below the poverty line. 49.6% of Fayetteville's population describes themselves as religious, slightly above the national average of 48.34%. 50.8% of people in Fayetteville who describe themselves as having a religion are Baptist (25.22% of the city's total population). 15.5% of people holding a religion are Catholic (7.7% of the city's total population). There are also higher proportions of Methodists and Pentecostals above the national average. Although much of the Fayetteville–Springdale–Rogers Metropolitan Area has grown with Walmart's ascent to the #1 corporation listed by the Fortune 500, Fayetteville has often made it clear that the city prefers to associate itself with the University of Arkansas rather than the worldwide retailer. Walmart is based in nearby Bentonville, Arkansas and is one of six Fortune 500 corporations based in the state (the others being Dillard's, J.B. Hunt, Murphy Oil, Tyson Foods, and Windstream). Tyson Foods is based in Springdale, Arkansas, which is adjacent to the north of Fayetteville. Despite not being based in Fayetteville, these corporations have a big impact through the University of Arkansas. The Sam M. Walton College of Business (named for Sam Walton) at the University has received numerous donations from the Walton family. Tyson also has a presence on campus at the Tyson Center for Excellence in Poultry Science, which holds classes for the Dale Bumpers College of Agricultural, Food and Life Sciences. The poultry science program at Arkansas is one of the Top 3 programs in the United States. Transportation company J. B. Hunt is based in Lowell, Arkansas. It has donated millions of dollars to the university's logistics program, including $10 million funding the J.B. Hunt Center for Academic Excellence that completed in 2010. The University of Arkansas has also been changing into a research-centered university since the late-20th century. The university's stated goals now include becoming the economic engine for the region, the state of Arkansas, and beyond. This focus on innovation has helped draw students who were interested in research to Fayetteville. The university took a big step towards its new focus in 2010, when it was designated as a "very high activity research university" by the Carnegie Foundation for the Advancement of Teaching. In 2012, Forbes magazine ranked Fayetteville #15 on its list of "Best Places For Business And Careers," using criteria such as the cost of doing business, cost of living, educational achievement, and crime rate. In 2010, it was named #3 by Inc. Magazine on a list of "Best Mid-size Cities for Doing Business". Fayetteville shares many of the characteristics commonly given to Arkansas as a Southern state, yet it has also absorbed cultural influence from the Mid and South West. Located firmly in the Upper South, Fayetteville's culture is distinct and it differs from the southeastern portion of the state and other Southeastern Conference college towns, areas more commonly associated with the Deep South. Many of the city's first settlers came from Upper South states like Kentucky and Tennessee, who found the Ozarks familiar to the Appalachian Mountains back home. The uplands of Arkansas, including the Fayetteville area, did not participate in large-scale plantation farming with slaves like the Arkansas delta, instead electing to settle in small clusters, relying largely on subsistence agriculture and hunting rather than the settlement patters common in the Midwest and Deep South. The "hillbilly" stereotype given to the Ozarks and Appalachians is largely a derivative of the difficult topography, tendency to settle in clusters, and mostly cashless self-sustaining economy found in those regions. Fayetteville's large proportion of Southern Baptist and Methodist adherents does reflect a trend often associated with the Deep South. The city also derives a cultural identity from the University of Arkansas, exhibiting many trademarks of a college town such as a prominent arts and music scene, emphasis on local businesses, college-oriented bar/restaurant entertainment district, progressive residents and a focus on environmental sustainability. Fayetteville also shares a passion for collegiate athletics similar to many other Southeastern Conference member institution cities, such as Oxford, Mississippi and College Station, Texas, earning a #7 ranking on Forbes' "Top College Sports Towns" list. Fall 2012 enrollment reports indicate that 60% of UA students were from Arkansas, 15% from Texas, 6% from Missouri, 5% from foreign countries, and the remaining 14% from other states. Fayetteville has a strong BBQ tradition, earning a #8 ranking on the "Top 10 Best BBQ Cities" by Livability. The majority of Fayetteville's restaurants serve Memphis-style barbecue, with some Texas influence. The Bikes Blues and BBQ motorcycle rally places an emphasis on the city's BBQ heritage. The University of Arkansas is Fayetteville's biggest attraction, with influence in the social, economic and educational aspects of Fayetteville. The flagship university in the state, the U of A has become integrated with Fayetteville and vice versa. The University of Arkansas Campus Historic District listed on the National Register of Historic Places contains 71 acres (28.7 ha) and 25 buildings within a park-like arboretum. In autumn, thousands of parents travel to Fayetteville to help their children move into the various residence halls and apartments in the area, with thousands more attending Razorback football home games. Fans return for basketball games to pack Bud Walton Arena, which was the fifth-largest on-campus arena upon completion. In spring the Hogs baseball team can be seen in Baum Stadium, named the top college baseball facility in the nation by Rivals.com in 2010. No matter the season alumni and visitors are drawn to wander the campus in search of special names on Senior Walk, which is a 5-mile (8.0 km) sidewalk record of every graduate from the University of Arkansas, and the only sidewalk of its kind in the world. TheatreSquared, Northwest Arkansas's only year-round professional regional theatre, is located just off Dickson Street, with an annual audience of 18,000 patrons including 7,500 students reached through outreach programs. The theatre was recognized in 2011 by the American Theatre Wing as one of the nation's ten most promising emerging theatres. The Fayetteville Public Library, founded in 1916, was relocated in October 2004 into a $23 million building, which was the first "green" building in Arkansas. The Blair Library was awarded the 2005 Thomson Gale Library Journal Library of the Year award, and, as a testament to its popularity, has seen its popularity increase dramatically, with three times more items checked out in 2005 than in 1997. The library includes a local coffeeshop, Arsaga's, and hosts several events, including film festivals, book signings, and public forums throughout the year. Fayetteville contains 60 listings on the National Register of Historic Places (NRHP), the official federal list of districts, sites, buildings, structures, and objects deemed worthy of preservation. The University of Arkansas Campus Historic District constitutes the historic core of the UA campus. Residential historic districts with historically and architecturally significant contributions to Fayetteville include the Mount Nord Historic District, Washington-Willow Historic District, and Wilson Park Historic District. The Square is anchored by five NRHP structures; the original Fayetteville post office built in 1911, the Old Bank of Fayetteville Building, the Lewis Brothers Building constructed in 1908, the Mrs. Young Building built in 1887, and the Guisinger Building. The former Washington County Courthouse and Old Washington County Jail are located one block east of the Square. The Fayetteville Parks and Recreation Department maintains 70 parks whose total land area makes up 3,129 acres (1,266.3 ha). The National Wildlife Federation has listed many parks and trails in Fayetteville as Certified Wildlife Habitats, which provide food, water, shelter, and a nurturing environment for young wildlife. A favorite park in Fayetteville is Wilson Park, which anchors the Wilson Park Historic District. The park was the city's first, and today contains a swimming pool, two playgrounds, a baseball field, picnic areas, and a 1981 castle in addition to courts for volleyball, basketball and tennis. The National Register of Historic Places-listed historic district encompasses 47 homes constructed in the late 19th and early 20th century along the southern edge of the park. Fayetteville operates within the mayor-city council form of government. The mayor is elected by a city-wide election to serve as the Chief Executive Officer (CEO) of the city by presiding over all city functions, policies, rules and laws. Once elected, the mayor also allocates duties to city employees. The Fayetteville mayoral election in coincidence with the election of the President of the United States. Mayors serve four-year terms and can serve unlimited terms. The city council consists of eight aldermen who together form the legislative body for the city. Also included in the council's duties is balancing the city's budget and passing ordinances. The body also controls the representatives of specialized city commissions underneath their jurisdiction. Two aldermen are elected from each of the city's four wards. Fayetteville is served by the Fayetteville Public Schools system, which consists of eight elementary schools, four intermediate schools, two special schools, and Fayetteville High School. The district was established in 1871 as the oldest school district in Arkansas. Fayetteville High School has been recognized by Newsweek as one of America's top high schools based on Advanced Placement (AP) courses as well as AP test scores. The school's student literary magazine and athletics programs have also received national praise. 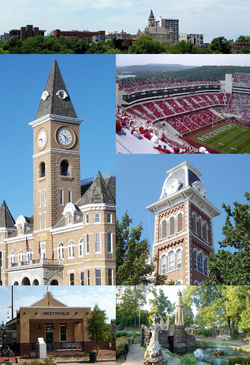 The University of Arkansas was founded in Fayetteville in 1871 as Arkansas Industrial University. The land-grant/space-grant, high-activity research institution is the flagship campus of the University of Arkansas System. Enrollment for the 2010 fall semester was 21,406 total students. Approximately 67% are Arkansas natives, with about 6% being international students. Although it offers over 200 degree choices (excluding doctorate fields), the university is noted for its strong architecture, history, creative writing, poultry science, and business programs. Because of the University of Arkansas' large presence in many aspects of the city's economy, culture, and lifestyle, Fayetteville is often portrayed as a college town. Donald W. Reynolds Razorback Stadium plays host to the Arkansas Razorbacks football team, usually hosting 6–7 home football games each season. One game is scheduled yearly at War Memorial Stadium in Little Rock, Arkansas, although there has been discussion of moving these games to Fayetteville in recent years. Some major high school football games in the state are played in Razorback Stadium as well. Bud Walton Arena is home to the Arkansas men's and women's basketball teams. This facility was built in 1993 and holds a capacity of 19,368. Arkansas volleyball plays in Barnhill Arena in addition to the Razorbacks gymnastics team, also on the campus of the University of Arkansas. The Arkansas Razorbacks baseball team plays in Baum Stadium at George Cole Field, the nation's premier college baseball facility. Softball plays in the newly built Bogle Park on campus. Due to the success of Arkansas's track and cross country teams, Fayetteville is sometimes called the "Track Capital of the World". The city has hosted the National Collegiate Athletic Association (NCAA) Division I Indoor Track and Field Championships at the Randal Tyson Track Center, one of the world's fastest surfaces. Arkansas also has hosted the Outdoor Track and Field Championships track facility at John McDonnell Field, named the "Top Outdoor Track and Field Facility of the Year" by the American Sports Builders Association in 2008. The Blessings golf course is a golf course located along Clear Creek in Fayetteville designed by Robert Trent Jones, Jr., it is said to be one of the most difficult golf courses in the U.S. The course is home to the University of Arkansas Razorbacks golf teams. Two stations are operated by the University of Arkansas, KXUA 88.3 FM, which is the student-run station and KUAF, 91.3 FM, a national public radio (NPR) station. Cumulus Media owns seven stations in the Northwest Arkansas market, KFAY 1030 AM (news talk), KYNG 1590 AM, KQSM-FM 92.1 FM (ESPN Radio), KAMO-FM 94.3 FM (classic country music), KRMW 94.9 FM, KKEG 98.3 FM (classic rock), and KMCK-FM 105.7 FM (Top 40). Clear Channel Communications owns four radio stations in the area, including KIGL 93.3 FM (classic rock), KMXF 101.9 FM (Top 40), KKIX 103.9 FM (country music) and KEZA 107.9 FM (adult contemporary). Butler Communications owns KXNA 104.9 FM (new rock), KREB 1190 AM, and KFFK 1930 AM. Kerm, Inc. operates two News Talk Information stations: KURM 790 AM and KLTK 1140 AM. KSEC 95.7 broadcasts in the Mexican Regional format and KFFK 1390 AM of Butler Communications broadcasts in the Spanish News/Talk format. Religious stations include KAYH 89.3 FM, KBNV 90.1 FM, and KLRC 90.9 FM. All sports radio station KUOA 1290 AM is rebroadcast on 105.3 in Fayetteville and features Arkansas Razorbacks coverage. KISR 95.9 FM is translated to Fayetteville from Fort Smith. Smaller operations include KOFC 1250 AM (news talk information) and KBVA 106.5 FM (variety). The City of Fayetteville owns and operates a large water system that provides services to several municipalities and unincorporated areas in the northern half of Washington County in addition to Fayetteville residents. Drinking water is pumped in from the Beaver Water District treatment plant in Lowell. The city uses Template:Convert/MUSgal of water per day on average. Fayetteville owns its own wastewater operation, including a network of pipes and lift stations which convey wastewater to the city's two wastewater treatment plants. Both plants are operated by CH2M Hill and regulated by the Arkansas Department of Environmental Quality (ADEQ). Historically, all sewage was sent to the Paul R. Noland Wastewater Treatment Plant (Noland WWTP) on the east side of town. However, development on the city's west side as well as the expense of pumping wastewater over East Mountain lead the city to build the West Side WWTP in 2008. In addition to these two facilities, Fayetteville also operates 39 lift stations to pump wastewater over steep elevation rises in order to utilize gravity flow toward the WWTPs. Fayetteville also maintains a biosolids management program, in which biosolids, a byproduct of wastewater treatment, are land applied to provide nutrients to soil on which crops are grown. Fayetteville's first wastewater treatment came in 1913 in the form of a Imhoff tank on the West Fork of the White River. This facility was improved several times throughout the years until the construction of the City of Fayetteville Water Pollution Control Facility downstream of Lake Sequoyah. This plant was built in 1968 and has since seen major upgrades and expansion. Now known as the Noland WWTP, it is designed for a flow rate of Template:Convert/MUSgal per day. The West Side WWTP has a design flow of Template:Convert/MUSgal per day with a peak flow capacity of Template:Convert/MUSgal per day during wet weather. ^ "#28 Fayetteville, AR". Best Places For Business And Careers. Forbes. 2013. http://www.forbes.com/places/ar/fayetteville/. Retrieved July 23, 2011. ^ Bartholomew, Dustin (November 9, 2009). "Does Fayetteville really need a nickname?". Fayetteville Flyer. http://www.fayettevilleflyer.com/2009/11/09/does-fayetteville-really-need-a-nickname/. Retrieved July 18, 2013. ^ Gill, Todd (December 18, 2012). "City Council recap for Dec. 18, 2012". Fayetteville Flyer. ^ "American FactFinder". United States Census Bureau. http://factfinder2.census.gov/faces/nav/jsf/pages/index.xhtml. Retrieved 2014-12-02. ^ "Population Estimates". United States Census Bureau. http://www.census.gov/popest/data/cities/totals/2013/SUB-EST2013-3.html. Retrieved 2014-12-02. ^ Stewart, Charles W. (March 1, 2012). "Fayetteville (Washington County)". Encyclopedia of Arkansas History and Culture. Butler Center for Arkansas Studies at the Central Arkansas Library System. http://www.encyclopediaofarkansas.net/encyclopedia/entry-detail.aspx?entryID=1006. Retrieved July 20, 2013. ^ "Comprehensive Arkansas Higher Education Annual Report" (PDF). Arkansas Department of Higher Education. December 1, 2011. http://www.adhe.edu/SiteCollectionDocuments/Comprehensive%20Report/2011/5-StudentEnrollment-ANNUAL.pdf. Retrieved July 20, 2013. ^ "Men's Indoor Track and Field Championship History". National Collegiate Athletics Association (NCAA). http://www.ncaa.com/history/trackfield-indoor-men/d1. Retrieved July 20, 2013. ^ "Men's Outdoor Track and Field Championship History". NCAA. http://www.ncaa.com/history/trackfield-outdoor-men/d1. Retrieved July 20, 2013. ^ "Men's Cross Country Championship History". NCAA. http://www.ncaa.com/history/trackfield-outdoor-men/d1. Retrieved July 20, 2013. ^ Burke, Monte (2010). "In Depth: Top College Sports Towns". Forbes. http://www.forbes.com/2010/03/05/college-sports-towns-lifestyle-sports-college-towns_slide_5.html. Retrieved July 24, 2011. ^ "Best Places For Business And Careers". Forbes. 2007-04-05. http://www.forbes.com/lists/2007/1/07bestplaces_Best-Places-For-Business-And-Careers_land.html. Retrieved 2007-07-31. ^ Lagesse, David (September 20, 2007). "Best Places to Retire: Fayetteville, Arkansas". U.S. News. http://money.usnews.com/money/personal-finance/best-places-to-retire/articles/2007/09/20/best-places-to-retire-fayetteville-arkansas. Retrieved July 30, 2011. ^ Zumbrun, Joshua (June 10, 2009). "In Pictures: The Best And Worst Cities For Recession Recovery". Forbes. http://www.forbes.com/2009/06/09/recession-economy-cities-business-beltway-recovery-cities_slide_3.html. Retrieved July 30, 2011. ^ a b "Fayetteville History: 1860s" (Website). Fayetteville, AR. http://www.fayettevillehistory.org/1860s/. Retrieved July 10, 2011. ^ Appletons' annual cyclopaedia and register of important events of the year: 1862. New York: D. Appleton & Company. 1863. p. 451. http://archive.org/stream/1862appletonsan02newyuoft#page/n458/mode/1up. ^ Wappel, Anthony J; Simpson, Ethel C (2008) (Hardback book). Once Upon Dickson, An Illustrated History, 1868–2000 (First ed.). Fayetteville, AR: Phoenix International. p. 85. ISBN 978-0-9768007-7-4. ^ "National Register of Historic Places". Little Rock, Arkansas: Arkansas Historical Preservation Program. http://www.arkansaspreservation.com/historic-properties/national-register/results.asp. Retrieved June 8, 2013. ^ Branner, George C. (1984). "Mineral Resources of Benton, Carroll, Madison, and Washington Counties". ^ "Fayetteville Shale: Map, News, Video". geology.com. http://geology.com/articles/fayetteville-shale.shtml. Retrieved July 24, 2011. ^ a b c Arkansas State Highway and Transportation Department (December 22, 2011). General Highway Map, Washington County, Arkansas (Map). Cartography by Planning and Research Division. http://www.arkansashighways.com/maps/Counties/County%20PDFs/WashingtonCounty.pdf. Retrieved January 13, 2013. ^ Cox, Dale. "Boston Mountains Scenic Loop - Boston Mountains, Arkansas". Explore Southern History. http://www.exploresouthernhistory.com/arboston1.html. Retrieved January 13, 2013. ^ "Update of Statistical Area Definitions and Guidance on Their Uses" (PDF). Executive office of the President Office of Management and Budget. December 1, 2009. p. 32. http://www.whitehouse.gov/sites/default/files/omb/assets/bulletins/b10-02.pdf. Retrieved January 13, 2013. ^ "NowData - NOAA Online Weather Data". National Oceanic and Atmospheric Administration. http://www.nws.noaa.gov/climate/xmacis.php?wfo=tsa. Retrieved 2012-02-15. ^ "Monthly Averages for Fayetteville, AR (72703)" (Table). The Weather Channel. http://www.weather.com/outlook/travel/vacationplanner/wxclimatology/monthly/72703. Retrieved 2011-11-20. ^ "Comprehensive Annual Financial Report for the Year Ended December 31, 2010". City of Fayetteville, Arkansas. 2010. p. 120. Archived from the original on October 1, 2011. http://www.accessfayetteville.org/government/accounting_and_audit/documents/cafr/2010_CAFR_for_the_City_OF_Fayetteville.pdf. Retrieved July 30, 2011. ^ "Fortune 500". Forbes. 2013. http://money.cnn.com/magazines/fortune/fortune500/2013/full_list/index.html?iid=F500_sp_full. Retrieved May 26, 2013. ^ "Poultry Science Program Overview". Dale Bumpers College of Agricultural, Food and Life Sciences. http://poultryscience.uark.edu/4457.htm. Retrieved July 30, 2011. ^ "Securities and Exchange Commission Form 8-K, Current Report Pursuant to Section 13 or 15(d) of the Securities Exchange Act of 1934". J. B. Hunt Transport Services, Inc.. October 13, 2005. ^ "Search result for Very High Research Institutions". Carnegie Foundation for the Advancement of Teaching. http://classifications.carnegiefoundation.org/lookup_listings/srp.php?clq=%7B%22basic2005_ids%22%3A%2215%22%7D&limit=50,50&orderby=sortname&start_page=standard.php. Retrieved July 30, 2011. ^ "University of Arkansas Elevated to Highest Carnegie Classification Among U.S. Universities and Colleges". University of Arkansas. http://newswire.uark.edu/article.aspx?id=15540. Retrieved July 30, 2011. ^ "Slide Show: The Best Places For Business And Careers". Forbes. http://www.forbes.com/2010/04/13/best-places-for-business-beltway-business-places-10-main_slide_16.html. ^ "The Top 20 Midsize Cities for Doing Business". Inc. Magazine. http://www.inc.com/ss/the-top-20-midsize-cities-for-doing-business#20. Retrieved July 30, 2011. ^ Lancaster, Guy (June 7, 2013). "Arkansas's Regional Identity". http://www.encyclopediaofarkansas.net/encyclopedia/entry-detail.aspx?entryID=5857. Retrieved August 18, 2013. ^ Kelso, Stirling. "The South's Best College Towns". Southern Living. http://www.southernliving.com/travel/best-college-towns-00417000074763/page18.html. Retrieved August 18, 2013. ^ Burke, Monte. "7. Fayetteville, Ark. University of Arkansas". Top College Sports Towns. Forbes. ^ "State of Origin". Enrollment Report. University of Arkansas Office of Institutional Research. 2012. http://oir.uark.edu/students/enrollment_state.html. Retrieved August 18, 2013. ^ a b Glen Bennett, Rob Yallop, and Ralph S. Wilcox (May 20, 2009). "National Register of Historic Places Registration: University of Arkansas Campus Historic District" (PDF). National Park Service. p. 26. http://www.nps.gov/history/nr/feature/weekly_features/UnvirofArkansasCampusHD.pdf. Retrieved 2001-08-18. ^ a b Rogers, Kendall (October 28, 2008). "Rivals 10: College Baseball's Best Stadiums". Rivals.com. http://collegebaseball.rivals.com/content.asp?CID=869295. Retrieved 2011-08-18. ^ "Walton Arts Center: Mission and History". Walton Arts Center. http://www.waltonartscenter.org/aboutus/missionandhistory.aspx. Retrieved July 23, 2011. ^ "American Theatre Wing Recognizes 2011 National Theatre Company Grant Winners". TheaterManie. http://www.theatermania.com/new-york-city/news/10-2011/american-theatre-wing-announces-2011-national-thea_41779.html. Retrieved February 12, 2012. ^ "Last Night Fayetteville". Last Night Fayetteville. http://www.lastnightfayetteville.com. Retrieved 2013-11-26. ^ "Fayetteville Square Farmers Market". Local Harvest. June 10, 2010. http://www.localharvest.org/fayetteville-square-farmers-market-M654. Retrieved August 6, 2011. ^ a b "FMC Highlights Fayetteville Farmers Market". Fermers Market Coalition. August 4, 2011. http://farmersmarketcoalition.org/fmc-highlights-fayetteville-farmers-market. Retrieved August 6, 2011. ^ "Fayetteville Public Library: History". Fayetteville Public Library. 2007. http://www.faylib.org/information/history.asp. Retrieved 2007-07-31. ^ "Clinton House Museum". http://www.clintonhousemuseum.org. Retrieved July 3, 2011. ^ Fayetteville Parks and Recreation Department. Map of Fayetteville Parks (Map). http://www.accessfayetteville.org/government/parks_and_recreation/documents/maps/Map%20of%20Fayetteville%20Parks.pdf. Retrieved August 2, 2011. ^ "Certify Your Wildlife Garden". National Wildlife Federation. http://www.nwf.org/Get-Outside/Outdoor-Activities/Garden-for-Wildlife/Certify-Your-Wildlife-Garden.aspx. Retrieved August 2, 2011. ^ "Wilson Park". City of Fayetteville. http://www.accessfayetteville.org/government/parks_and_recreation/parks/wilson_park.cfm. Retrieved August 2, 2011. ^ "Wilson Park and Mount Nord Historic Districts". City of Fayetteville, Arkansas. http://www.accessfayetteville.org/government/planning/documents/Wilson_Park_and_Mount_Nord_Historic_Districts.pdf. Retrieved August 2, 2011. ^ Spencer, Christopher. "Fayetteville designated as a bicycle friendly community (Community Announcement)". Ozarks Unbound. http://www.ozarksunbound.com/fayetteville-designated-as-a-bicycle-friendly-community-community-announcement/11366. Retrieved July 24, 2011. ^ "Current Bicycle Friendly Communities". League of American Bicyclists. May 2011. http://www.bikeleague.org/programs/bicyclefriendlyamerica/communities/pdfs/bfc_master_list_spring_2011_revised5.pdf. Retrieved July 24, 2011. ^ "Northwest Arkansas Razorback Regional Greenway" (PDF). Northwest Arkansas Regional Planning Commission. June 2010. http://www.nwarpc.org/pdf/Transportation/Razorback%20Regional%20Trail.pdf. Retrieved July 24, 2011. ^ "Scull Creek Trail". City of Fayetteville, Arkansas. http://www.accessfayetteville.org/government/parks_and_recreation/trails_and_greenways/scull_creek_trail.cfm. Retrieved July 24, 2011. ^ a b (Brochure) Trails Guide, Fayetteville, Arkansas. City of Fayetteville, Arkansas. http://www.accessfayetteville.org/government/parks_and_recreation/documents/maps/2011_TrailsGuideBro_%28Final%29.pdf. Retrieved July 24, 2011. ^ City of Fayetteville, Arkansas (September 1, 2009) (PDF). City of Fayetteville, AR Master Trail Plan (Map). http://www.accessfayetteville.org/government/parks_and_recreation/documents/maps/2009_Master_Trails_Plan__11x17.pdf. Retrieved August 2, 2011. ^ "Fayetteville, Arkansas Mayor". City of Fayetteville. http://www.accessfayetteville.org/government/mayor/index.cfm. Retrieved July 31, 2011. ^ "Fayetteville, Arkansas City Council". City of Fayetteville. http://www.accessfayetteville.org/government/city_council/index.cfm. Retrieved July 31, 2011. ^ "Fayetteville, Arkansas City Clerk: Boards, Commissions and Committees". City of Fayetteville. http://www.accessfayetteville.org/government/city_clerk/boards_and_commissions/index.cfm. Retrieved July 31, 2011. ^ (2010) "America's Best High Schools: The List". Retrieved on August 3, 2011. ^ (February 8, 2010) "The 25 Best High School Athletic Programs". ^ "University of Arkansas". College Profiles. 2008. p. 21. http://www.collegeprofiles.com/uarkansas.html. ^ "Ark. Business online media newspaper Arkansas News ebusiness research journal". ArkansasBusiness.com. http://www.arkansasbusiness.com/article.aspx?aid=123773.54928.135902. Retrieved January 24, 2011. ^ "Office of Institutional Research | University of Arkansas". University of Arkansas. http://www.uark.edu/admin/uadata/students/enrollment_state.html. Retrieved January 24, 2011. ^ "Best Places in USA: The Best Places to Live & Explore… For Every Lifestyle, Fayetteville: Arkansas". Best Places in USA. 2010. http://www.bestplacesinusa.com/college_town/Arkansas/Fayetteville.html. Retrieved August 3, 2011. ^ Low, Chris (April 11, 2011). "Hogs' Petrino eager to take next step". ESPN. http://espn.go.com/blog/sec/post/_/id/21421/hogs-petrino-eager-to-take-next-step. Retrieved January 25, 2012. ^ "University of Arkansas, Fayetteville". National Collegiate Athletic Association. January 25, 2012. ^ "Solar Training Heads South to the Home of the Razorbacks in Fayetteville, Arkansas". January 28, 2011. http://www.solartraininghq.com/solar-training-heads-south-to-the-home-of-the-razorbacks-in-fayetteville-arkansas. Retrieved January 25, 2012. ^ (PDF) Arbitron Radio Metro Map Based on Fall 2011 Market Definitions (Map). http://www.arbitron.com/downloads/Arb_US_Metro_Map_11.pdf. Retrieved 2011-08-18. ^ "Arbitron Radio Market Rankings: Spring 2011". Arbitron. http://www.arbitron.com/radio_stations/census_description.htm. Retrieved 2011-08-18. ^ Pruna, Jocelyne (November 3, 2012). "Election Day Will Decide Two Positions for Beaver Water District". KFSM-TV. http://5newsonline.com/2012/11/03/election-day-will-decide-two-positions-for-beaver-water-district/. Retrieved January 13, 2013. ^ "Utilities Department". City of Fayetteville. http://www.accessfayetteville.org/government/utilities_department/index.cfm. Retrieved August 18, 2011. ^ "Wastewater Treatment History". City of Fayetteville. http://www.accessfayetteville.org/government/wastewater/misc/index.cfm. Retrieved January 20, 2014. ^ "﻿Paul R. Noland Wastewater Treatment Plant﻿". NPDES Permit Renewal Application (City of Fayetteville). November 2010. http://www.adeq.state.ar.us/ftproot/Pub/WebDatabases/PermitsOnline/NPDES/PermitInformation/AR0020010_Complete%20Application_20101201.pdf. Retrieved January 20, 2014. ^ "﻿West Side Wastewater Treatment Plant﻿". NPDES Permit Application (City of Fayetteville): 56. November 2005. http://www.accessfayetteville.org/government/wastewater/documents/NPDES_Permit_AR0050288_West_Side_WWTP_30Nov05.pdf. Retrieved January 20, 2014. ^ "﻿Biosolids Management Construction Permit﻿". Final State Construction Permit (City of Fayetteville, Arkansas Department of Environmental Quality). May 2010. http://www.adeq.state.ar.us/ftproot/Pub/WebDatabases/PermitsOnline/NPDES/Permits/AR0020010C.pdf. Retrieved January 20, 2013. ^ "Fayetteville: Reducing Waste, Space, Means Profit". Green Initiatives. Arkansas Business. December 10, 2012. http://www.arkansasbusiness.com/article/89497/fayetteville-reducing-waste-space-means-profit-green-initiatives-winner-20000?page=all. Retrieved January 20, 2014. This page uses content from the English language Wikipedia. The original content was at Fayetteville, Arkansas. The list of authors can be seen in the page history. As with this Familypedia wiki, the content of Wikipedia is available under the Creative Commons License.